The first one is a pure community contribution thanks to Simos Xenitellis who did a first draft on his own blog. 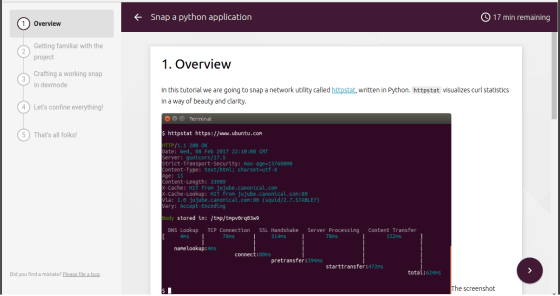 With only a little bit of guidance, we got his work turned into this excellent “Snap a python application” tutorial where you will snap a python command line utility illustrating how to access the network, how the snapcraft python plugin works amongst other features. The second is named how to snap a website. It illustrates how to turn a website into a snap and expose it graphically to Unity or any other desktop environment via the creation of a desktop file. You will also learn how to use the content sharing interface to make your snap only few kilobytes! Well done to everyone involved, and keep reading around for even more tutorials soon! We hope you’ll like playing and learning those new concepts in a fun and interactive way! See you soon during your next tutorial! Ubuntu tutorials are a topic-specific walkthroughs, giving you a very practical experience on a particular domain. They are just like learning from pair programming except you can do it on your own! They provide a step-by-step process to doing development and devops activities on Ubuntu machines, servers or devices. If you plan to help us contributing and creating a new ubuntu tutorial, it’s pretty simple! The backend is based on a simple google doc with a straightforward syntax. If you’d like to write your own tutorial here are some Guidelines you can follow that will help you with the tone of voice, content and much more. Let us know what you have done!